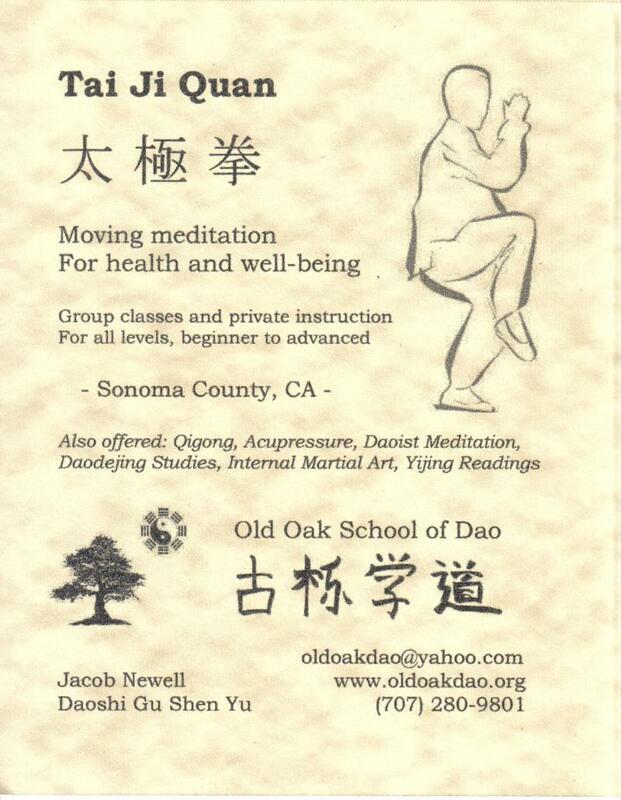 Please note that I am currently only available to work with people who are quite committed to practicing Taijiquan and/or meditation. If you have genuine interest and my approach seems to resonate with you, please email me to discuss. In 2019, I've opened up Bamboo Grove - a wuweidao cultivation group to continue the teaching & practice I received by my wuweidao lineage teacher, Liu Ming. 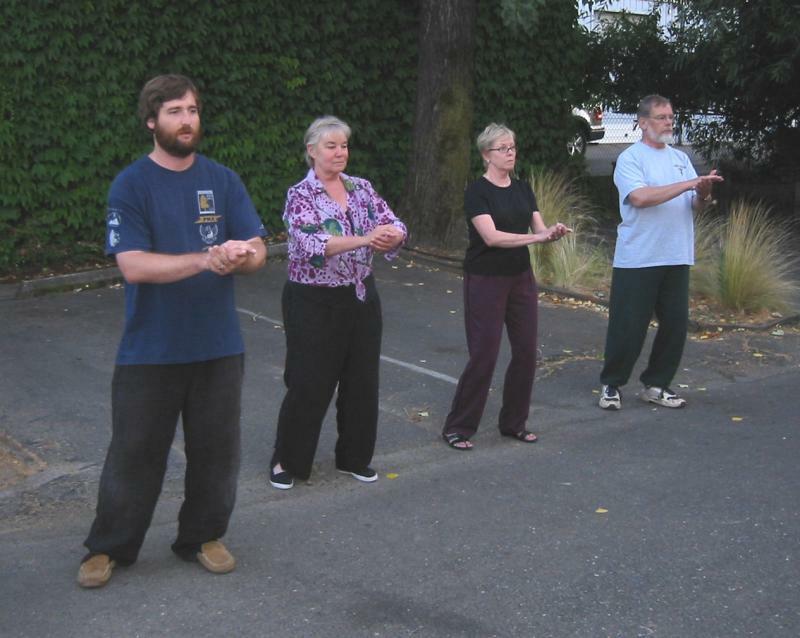 This group consists of up to 8 people who make a 1-year commitment to conduct a daily 1-hour formal practice of wuweidao. Practice consists of studying the Dao De Jing (unpublished translation & commentary by Wu Ming Chuan), non-conceptual meditation (Zuowang), and various supporting practices including neigong, tea ceremony, and altar ritual. We gather together monthly in Santa Rosa, CA, for guidance, inspiration, and discussion. Fee is $40/month. Entry requires attendance at an introductory gathering, or a private meeting. Participation at-a-distance is possible, for $20/month. Commitment is the same, minus attendance at monthly gatherings. Distance participants receive the same written materials but will miss out on certain important aspects, particularly tea, group discussion, and partner-practice. I will dialogue online regularly with distance participants. Wuweidao is an ancient tradition of meditation & qi-cultivation originating in the Yellow River region of pre-imperial China. It has close connections to the Daoist religion; however, it is a different lineage. A 1-year commitment will provide participants with a thorough introduction to the view and core method of wuweidao, with some exposure to the broad suite of supporting practices. Taijiquan instruction is currently on hold. If you are looking for a good teacher, I recommend Justin Eggert of Wu Academy in Santa Rosa. For those serious about their Taiji development, private lessons are indispensible. Includes elements described above, with emphasis on your personal development, as well as assistance in establishing your solo training regimen. $40/hour. For experienced Taiji practitioners or martial artists, I am available on a limited basis for informal meet-ups to practice Push-Hands (Tui-Shou) or Taiji martial applications.